Goodreads says, "Emma Townsend has always believed in stories—the ones she reads voraciously, and the ones she creates in her head. Perhaps it’s because she feels like an outsider at her exclusive prep school, or because her stepmother doesn’t come close to filling the void left by her mother’s death. And her only romantic prospect—apart from a crush on her English teacher—is Gray Newman, a long-time friend who just adds to Emma’s confusion. But escape soon arrives in an old leather-bound copy of Jane Eyre… Reading of Jane’s isolation sparks a deep sense of kinship. Then fate takes things a leap further when a lightning storm catapults Emma right into Jane’s body and her nineteenth-century world. As governess at Thornfield, Emma has a sense of belonging she’s never known—and an attraction to the brooding Mr. Rochester. Now, moving between her two realities and uncovering secrets in both, Emma must decide whether her destiny lies in the pages of Jane’s story, or in the unwritten chapters of her own." *Jane Eyre is one of my favorite classics and I love the idea of waking up one day in your favorite book. Plus, Eve Marie Mont is a local high school English teacher. It doesn't get any better than that! Fantastic pick! I can't wait to read this one either. A Breath of Eyre was going to be my WoW pick this week until I saw the new Gallagher Girls book. I really like the idea of a modern girl ending up in Jane Eyre's life. I love Jane Eyre! This one is definitely going to my wishlist! Awesome pick! I'm also waiting for this one ;) I love the cover :) haven't heard of this book! thank you for the fantastic feature! Oooo this one sounds all interesting and complex! I like that she's going to have to make a decision between staying in Jane's story and creating her own, the answer seems simple I think (wouldn't you want to choose your own story?) but I bet it's going to be way more complicated than that:) Awesome pick Christina! I have loved Jane Eyre since I first read it at 16, and this sounds really really good!!! Oooh, this sounds great. I love Jane Eyre as well. Great pick! I definitely want to read this!! i just saw it for the first time last week I think! Agreed. This does look really good. Good choice. The story sounds interesting. This looks like a great pick! Nice cover! New follower! I haven't heard about this one. Great pick! 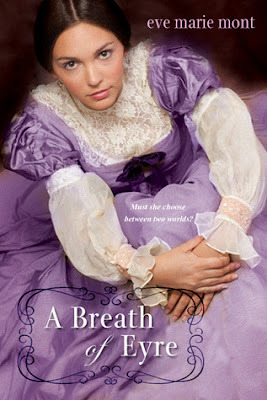 I recently added A Breath of Eyre on my wishlist as well, it sounds so good. I must admit that I have never read Jane Eyre but I do own a copy. Thanks so much for the shout-out, Christina! And you're a fellow teacher and Philly girl--yay! This one sounds a little like Little Women & Me and I'm definitely excited for both of them!! Wow! This sounds so promising! I think I need to add it to my list and do the necessary research!